The CP 42 is a multipurpose 4-row cup planter. The mounted or trailed machine is available with a wide range of options and can be easily tailored to your specific needs. The use of cage rollers or a ridging hood makes the CP 42 suitable for any type of soil. By combining seedbed preparation, planting and ridging in one working pass, the planter excels in ease of use. The large bunker and the potato-friendly planting elements complete this top tier planter. The CP-series cup planters are designed for potato growers who demand the most reliable planting precision. One of the cornerstones of this precision is the unique Miedema planting element found in each CP. 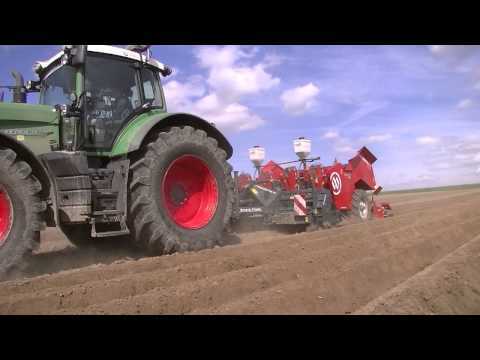 Every grower can work more efficiently thanks to the high planting capacity, low maintenance costs and exceptionally simple control system of our Miedema planters. The CP is also perfectly suited for combining multiple operations in a single working pass. This saves you labour, machines and fuel. Our reliable and extremely precise CP 42 cup planter is available in four variants. Saves time, money and man hours by combining seedbed preparation, planting and ridging in one working pass.